ABCCrypto is an ATL COM component for encrypting and decrypting data. It's incredibly simple to use and works with virtually any format you'll ever come across. You can encrypt or decrypt variants, BLOB data or files. ABCCrypto uses the standard Windows Cryptography API to ensure consistent behavior across all platforms. It uses RSA Encryption with 40 bit keys for a practical level of security throughout virtually any country in the world. ABCDrawHTML is a simple but powerful HTML rendering library. It allows you to create previews or thumbnails of web pages in a number of different formats from PNG to JPEG to TIFF to EMF. Because it doesn't use print drivers it renders web pages quickly and accurately. Because it's Both Threaded you can use it flexibly from within ASP, VB, .NET and under COM+ or MTS. 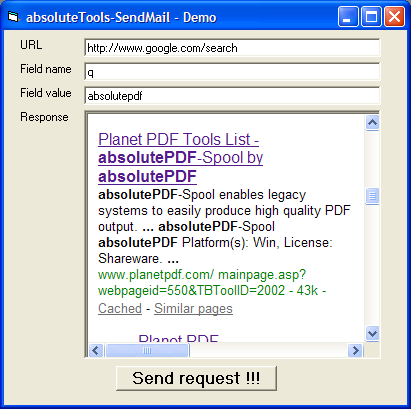 Use ABCpdf .NET to create and manipulate Adobe PDF documents from ASP, ASP.NET or .NET. Add text, images and graphics. Designed for a combination of maximum power and ease of use it goes Direct to PDF™ for blazing speed. Add horizontally and vertically aligned text. Insert paragraphs of multistyled text. Create separate columns and pages with precisely positioned elements. ABCpdf also supports image insertion and drawing graphic objects. 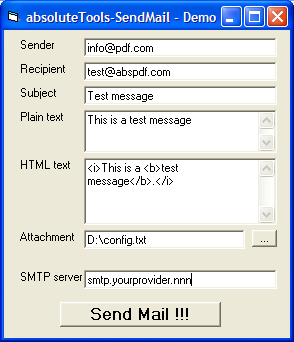 ABCUpload .NET enhances the basic .NET file upload functionality. It offers a number of advanced features such as Pure HTML Progress Bar ? support. GigUpload ? technology for truly massive uploads. Corruption Autofix ? to automatically de-corrupt common forms of corruption. It is Unicode compliant and MacBinary compatible - all in 100% Managed Code. HTTP file upload is as simple as ABC with ABCUpload. Our Pure HTML Progress Bar allows your visitors to see the progress of their upload in real time with absolutely no client side software. We also offer a number of other advanced technical features including Unicode Compliant, 120% MacBinary Compatible and BLOB Aware. Free license available. absolutePDF-Creator Easy is a easy to use ActiveX COM Control that enables you to create PDF files from within your Windows applications. Add text, lines, empty and colored shapes, images to create any PDF you like. Built-in support for image resizing and resampling. Automatic paragraph handling with overflow notice. Import existing PDF. Unicode and TTF support! Can be used with any ActiveX COM aware programming environment. absoluteTools-HTTP is a easy to use ActiveX COM Control enables you to Interact with any webserver using POST or GET requests, simulating human interaction. Full session cookie support! Can be used with VB, VC++, Delphi or any other ActiveX COM aware programming environment. This control supports both HTTP and HTTPS protocols (also with proxy) and is very suitable to create web spiders, automation tools and secure file transfer utilities.